Dyson is one of the most significant UK tech brands, and its Apple-like 'affordable premium' pricing means cut-price Dyson deals are highly sought after during sales, and at all other times, come to that. Some Dyson vacuum cleaners, heaters and fans (and, albeit to a lesser extent, grooming devices these days, too) crop up with discounts. We've rounded up the best Dyson offers available now and present them below. It was quite the undertaking. Who knew one brand could have so many similarly-named products on sale at once? What Dyson product are you shopping for? Absolutely everyone is doing £50 off the Dyson cordless flagship today. The chunky, powerful, ray-gun-lookalike Dyson Cyclone V10 Absolute is the best cordless vac for people who would really prefer a non-cordless vac, and it's £449 right now. In fact, so many shops are doing this 'deal', we are beginning to suspect it's unofficially the new RRP. Dyson's cordless vacuums are its flagships and according to Sir James Dyson, all development on corded ones has stopped. 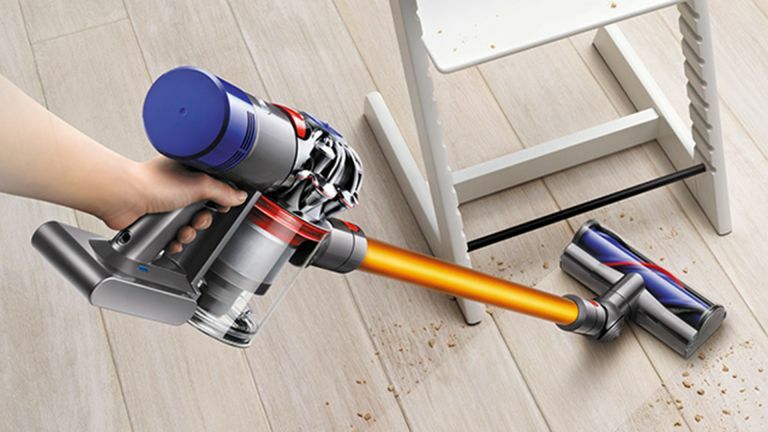 For a long time, Dyson handheld, cordless, bagless vacs were way out in front of the competition. Today, the likes of Bosch, Shark, Vax and Philips have pretty much caught up, but Dysons remain the most desirable of all, and they are generally excellent. Some users are put off by the short-ish battery life, but if you think of it as something you use for regular spruce-ups, rather than once-a-month mega-cleans, even the lowest duration offered (10 to 12 minutes on the 'turbo' setting, or 20-40 on the lower power, depending on what model you use) is perfectly adequate. Light and manoeuvrable, they're also great for cleaning off surfaces, tables, backs of TVs, even cobwebbed ceilings. While the V10 has been specifically marketed as a corded vac replacement, and good for everything from deep pile carpets to light dusting, in point of fact its predecessor the V8, and its more obscure cousin the V7 had already cracked that. Especially if you have mainly hard floors, they are all the vacuum cleaner many people will ever need. • Here is our number one top Dyson cordless buying tip. The Dyson V7 and V8 models are barely inferior to the V10 when it comes to floor cleaning and both more compact and more of a pleasure to use when using your Dyson cordless as a pure handheld. The V7 Trigger is just a handheld – there's no extension tube or motorised floor-cleaning head. The older V6 is admittedly a bit crap by comparison, but as a backup device, or if you have a fairly small place, with mainly hard floors, it's surprisingly good for its age. This can be a touch confusing but we'll try to explain as best we can. Animal models (or ones with no suffix) come with a motorised head for floors, a smaller motorised head for upholstery, stairs etc – both of these are good for getting rid of pet hairs but are also useful to non-pet owners. The other tools are the essential extension pole so it's not just a handheld, a combi tool for general handheld cleaning, a crevice tool and a brush tool for dusting – this one seems entirely superfluous due to the presence of the combi tool, but there it is. Absolute models are exactly the same but add an excellent spongey, motorised head specifically for doing hard floors. Total Clean bundles include an extra flexible crevice tool and attachment for cleaning the tops of cupboards from below with – both quite handy but hardly essential. Does what you see below look atrocious on your mobile, with acres of white space? Try this alternative version. You don't see many deals on this device, presumably due to a lack of economies of scale in its production, and the fact that it's the most expensive thing Dyson sells, at least until such time as its cars come online. We reviewed the Dyson 360 Eye when it came out. It's by no means a perfect device but if you can live with its rather slow cleaning and habit of getting stuck, it is undeniably among the best robot vacuum cleaners you can buy. It has an unusually good app (which can also control all Dyson's other connected products), impressive suction and even looks quite good. In the Far East, Dyson has actually released a Robot 2.0: the 360 Heurist. This is better able to 'see' in low light and boasts improved cleaning performance, but there's no sign of it launching in the West any time soon. If you're in the market for a more serious vacuum cleaner, do the same as in unarmed combat and go for the Balls. Dyson vacs sits on a ball, as opposed to wheels, which swivels around itself making it easier to change direction. The Ball is available on both upright and cylinder models and also in compact ('Small Ball') and standard (yes, 'Big Ball') incarnations. Upright vacuums are often easier to store (as long as you have a tall enough cupboard), cover large floor areas better and are good on pet hair. Cylinders tend to be lighter, easier to manoeuvre, sit on stairs and are often quieter. Our favourite is the Dyson Big Ball Animal 2 cylinder vac. Stable, powerful and designed to spring back up should it ever fall over, this is a textbook cylinder cleaner with some very handy additional heads. The more basic Ball Multi Floor is also a solid choice, especially when discounted. If you're more an upright citizen, the two Light Ball models (Animal and Multi Floor, again) are also excellent value. They're unusually lightweight uprights, and in this type of vac the 'Ball' element really comes into its own. This engineering triumph allows the vacuum to dance it's way around corners and angles, and is pleasingly easy on the arm. A handy, pull-out suction tube is handy for doing surfaces, picture frames and ceilings. If you have a large home full of deep pile and pets, you may want to consider a heavier weapon, in the form of the heftier Ball Animal 2. It's more expensive, but you do get what you pay for, here. • The Animal variants of these vacs come with turbine tools for dragging stubborn pet hair out of the clutch of furnishing fabrics. As well as the 'official', current Dyson models, there are plenty of slightly older models out there at numerous retailers. The best prices we can find for this dad's army of good to excellent vacs can also be found below. It also has devices that can do various combinations of heating, cooling and purifying. Confused yet? It's happily become quite simple since Dyson stopped calling its devices things like 'AM09' and instead called them, for instance Pure Hot + Cool. For a while, fans with app compatibility had the word 'Link' in the name too but as all new Dyson devices feature smart home connective tech that's no longer the case. However, you can still buy older devices with 'Link' in the name. So both the new Pure Hot + Cool and the old Pure Hot + Cool Link have app connectivity. Right, now we really are confused. On with the deals, then. Ahem. • Our top tip for Dyson fans and purifiers. You're usually off getting the latest models rather than the less expensive, older 'Link' ones. They are better at what they do, and more attractive. However, if the older models are significantly cheaper due to being on sale, they become quite tempting. The Pure Cool tower and desk (not shown proportionately). Dyson's latest move has been into grooming products, with the revolutionary Supersonic hair dryer and the brand new, multi-headed Airwrap styling, erm… thing. You won't find many deals on the latter just yet, but there are sometimes discounts to be had on the hairdryer.